WaterMax® is a patented, comprehensive water treatment system; truly the right water cleaner for our age of conservation – the world's most efficient water treatment system. From computerized solid-state Systems Control to our exclusive directional flow screens, only the most advanced manufacturing processes and materials have been used to build WaterMax®. Made by some of the most innovative engineers in the industry and have won 7 U.S. patents ensuring that WaterMax® provides years of trouble-free water treatment in your home, which is why it is known throughout the world. 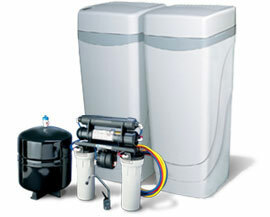 The WaterMax will work for you in ensuring that your entire house receives the benefits of soft, clean water. You’ll be able to taste the freshness of sweet corn, feel the softness of a new shirt and say goodbye to that film around the tub. And it won’t just do good work, it will look good too. The styling of a WaterMax® is as impressive as its operational capabilities. There simply is no better looking unit on the market today. Even the texture of the cabinet is quality you can feel. When you purchase a WaterMax, you're buying the power of multiple conventional water softening units in one integrated package. WaterMax can save you not just space, but also literally thousands of dollars as you have to purchase just one WaterMax water softening appliance to do the job of four of theirs. Truly tailor made for you water. Only WaterMax® with its multi-compartment tank can offer many different water treatment media configurations to tailor and optimize WaterMax® for your specific water treatment needs. What is "media"? Think of it as simply many different types of material with many different textures and colors - all with the ability to improve water when water runs through it. The beauty of WaterMax® is that whole-house this comprehensive water treatment happens in one appliance. Competitors don't have the patents we do and, to get around it, they must install a series of different models to do the same thing. Not only does the WaterMax give you the highest quality water from a single system, but also enhanced reliability and high flow rates by not needing as complicated an installation as others. More Resin. More Softening Capacity. Hague uses high-capacity fine mesh resin, vacuum VIBRAPACKED™ for maximum treatment of hardness in your water. The flexibility of the solid-state Systems Control makes it possible. The Systems Control will even take into account water usage patterns and intelligently make changes to it's standard operation for an amazingly consistent high-quality supply of treated water. A low voltage 12 VAC transformer powers the Systems Control and once it is set, no other maintenance is required except the periodic addition of salt or salt substitute. Integrated power outage protection will protect the system by retaining settings through an outage without the need for batteries. The Systems Control even let’s you know if there’s a leak in your household plumbing fixtures. The Hydro-Slide Piston is the only internal moving part and is Teflon® encapsulated for years of trouble-free operation. Hague's valve has been tested for over 100,000 cycles with no detectable wear. Blending Valve is installer-adjusted to precisely match your softness preference. It’s a Hague exclusive feature which adjusts the salt dosage to the exact amount required for each regeneration. It means that the WaterMax® never wastes salt or water. 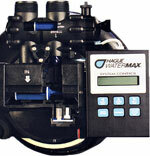 The WaterMax is a fully NSF Certified and listed system. Because the WaterMax is such an advanced and efficient system, each system is proudly provided with a complete set of detailed Engineering Specifications. Ask your independent dealer for a copy! We have been selling Hague for more than 10 years and have received Circle of Success awards for best service and also Top Sales, Top Ten Dealers awards. We are your professional source!